Selecting the best elastomer for an application involves answering many questions. Temperature and other environmental factors can affect the long-term physical properties of a compound. The best place to begin a search is with existing information. Look for a material with a solid balance of the properties desired for the application. Information about the original material and service conditions can be of help when seeking a replacement material for an existing product. For new products, similar applications can provide valuable information. The choice of the best suited elastomer for any component is an extremely important one. Use of the right elastomer will give you a much extended product life. This should enable you to fit the component & forget about its premature replacement. Tell us the application & working conditions of your required rubber component, and we will advise you on the best suited rubber for it. The following checklist provides several characteristics that need to be taken into consideration when specifying a choice of elastomer (mentioned properties are guiding values). It is the maximum stress that the rubber can withstand while being stretched or pulled before breaking. Tensile strength is extremely important in applications with high physical applications such as tyres/conveyor belts but is less relevant for products like gaskets/bushes. Hardness is defined as a material's resistance to indentation. The more the hardness of a component, the less it will deform under pressure, stress. Generally, increase in hardness results in increase in tensile strength, decrease in elongation, and increase in compression set. With regards to the best combination of physical properties, the "sweet spot" is regarded at around 60 Shore A. This is possibly the most important property for Gaskets, Seals, O-Rings. Compression set is defined as the permanent deformation remaining after release of a compressive stress. It is expressed as the percentage of set with respect to the original specimen thickness. The lower the compression set, the better. Gaskets/Seals with high compression set cause loss in sealing pressure over time and hence failures/ leakages. Ageing in sunlight, ozone, heat, storage, etc. All polymers & products based on them are subject to degradation on exposure to the degradative environments such as, Storage ageing, Oxygen, Heat, UV Light & Weathering, Catalytic degradation due to the presence of heavy metal Ions (Cu, Mn, Fe etc. ), Dynamic Flex - Fatigue, Ozone (Static / Dynamic / Intermittent exposure). These factors degrade rubbers / rubber products causing substantial changes in their technical properties and ultimately lead to their failure during service or shorten the expected service life in the absence of Antioxidants. Hence, while compounding, one has to protect the product against oxidative and other ageing factors. Choice & dosage level of anti-degredants (antioxidants / antiozonants, M.C. Wax) play important role in product life & performance, Aminic type of anti-degredants are more effective against heat ageing where as p-plylenediamine types are effective against ozone & flex fatigue resistance. In case of non-black products bisphenolic & MBI type are used to a level of success. On ageing, vulcanised (product) degrades & physical properties drop, ultimately to a point that the product fails. It's important to know which physical, mechanical and chemical resistance properties are required. It's also important that a material is compounded and tested to meet any necessary industrial specifications such as UL, ASTM, IS, BS, SAE, FDA, NSF International Standards. Listed below are brief summaries of the properties of seven of the most versatile elastomers, and the physical/chemical resistance comparison charts for the seven elastomer materials. These lists are by no means all-inclusive. However, a majority of sealing, gasketing and weather stripping needs can be met using these popular materials. Information is available about a more complete list of elastomers, including exotic and high-tech materials, and can be provided on request. Silicone (Polysiloxane) features excellent resistance to ozone, sunlight and oxidation, and is very colour stable. It also maintains excellent flexibility at low temperatures, has outstanding resistance to high heat, has low compression set and is a very good electrical insulator. However, it is not recommended for applications that require abrasion resistance, tear and cut growth resistance and high tensile strength. Nor is it recommended for resistance to oil, gasoline, solvents, alkalis and acids. excellent resistance to alkalis, acids and oxygenated solvents. It is not recommended for resistance to oil, gasoline and hydrocarbon solvents. EPDM is found in a wide range of applications and is excellent for outdoor use. to ozone, sunlight and natural aging. It has poor resistance to oxygenated solvents. Nitrile is superior to neoprene in oil and solvent resistance, but is not recommended for applications where it is exposed to severe weathering. Viton (Fluoroelastomer) provides premium performance and long-term reliability in very harsh and corrosive environments. Their exceptional resistance to heat aging and a broad range of fuels, solvents and chemicals makes them ideal for many demanding aerospace, automotive and industrial applications. Fluoroelastomers also offer excellent resistance to weather, ozone, oxygen and sunlight, and are inherently more flame retardant than hydrocarbon rubbers. Fluoroelastomers have poor resistance to ketones, esters, ethers, amines and aqueous bases (e.g., ammonia and sodium hydroxide). SBR (Styrene-Butadiene-Rubber) has excellent impact strength, good resilience, tensile strength, abrasion resistance and maintains flexibility at lower temperatures. It is not the elastomer of choice where resistance to oil, gasoline and hydrocarbon solvents is required. SBR materials are also not suitable for exposure to the outside elements such as UV and ozone. Typical uses of SBR have been in tyre treads, conveyor belt covers, mats and even shoe soles. Neoprene (Polychloroprene) has moderate resistance to oils and gasoline. It features good flame resistance, weathers well and has very good resistance to abrasion, flex cracking, alkalis and acids. However, expect poor resistance to aromatic and oxygenated solvents and limited flexibility at low temperatures. Neoprene is generally considered an excellent all-purpose elastomer with a solid balance of properties and few limitations. 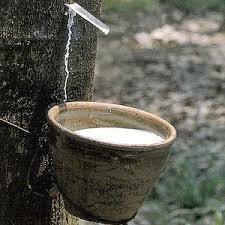 Natural Rubber (Polyisoprene) as the name suggests is the only naturally occurring elastomer. It has excellent impact strength, resilience, tensile strength, abrasion resistance and tear resistance. It is not recommended for applications where resistance to oil, gasoline and hydrocarbon solvents is required. Natural Rubber, due to its high level of un-saturation, is not suitable for high temperature applications and exposure to the outside elements such as UV and ozone. Natural Rubber is usually used for applications where the highest physical properties are required, i.e. tyres, conveyor belts, etc. ​The information, figures, calculations, test values and data contained in this page - which we use to best advise our customers - correspond to current engineering standards. This data is the result of many years of tests and trials. As individual operating conditions influence the application of each sheet, the information in this site can only be used as a rough guideline. In the individual case it is the sole responsibility of the customer to evaluate requirements, in particular if specified properties are sufficient for use. As we cannot have any influence over how our products are used, they are used entirely at the users’s own risk. We do of course guarantee the quality of our products according to general sales conditions, available on request. Subject to change and error. The mentioned properties are guiding values.